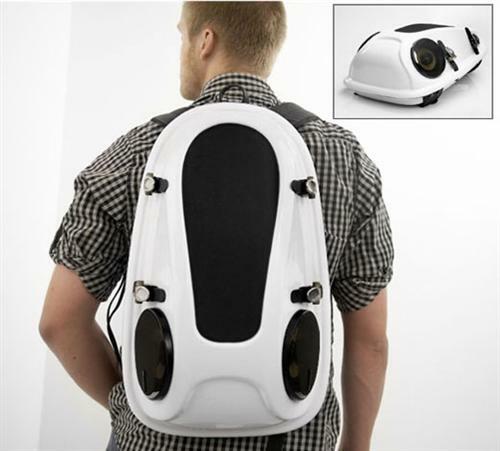 Reppo II Backpack Speaker System Will Make People Hate You | OhGizmo! By Evan Ackerman on 03/13/08 • Leave a comment! My current housemates would absolutely love the Reppo II backpack speaker system. It contains two full-range speakers and an amp, allowing you to broadcast exactly how awesome you are while you walk down the street. It’s perfect for the sort of people (like my housemates) who feel the need to inflict their taste in music upon everybody within amplified earshot, seeing as their wannabe hipster tunes are just too awesome not to share with the rest of the neighborhood. The backpack is hard shelled, which is good because it offers protection from the baseball bats which will inevitably be swung at you, but bad because it inhibits your running-away speed. The Reppo II is currently a functional concept in (thankfully) Germany.